New South Wales Waratahs will host the Super Rugby grand final against the Crusaders after producing an amazing defensive effort to defeat the Brumbies in the second semi-final at Allianz Stadium in Sydney. 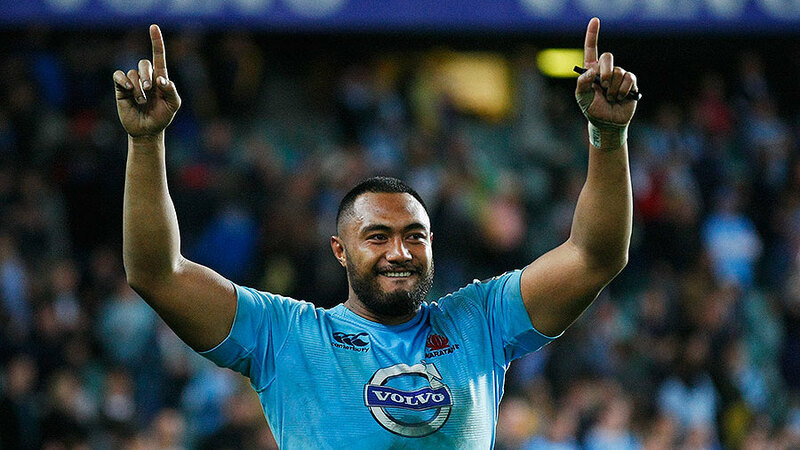 The Waratahs have broken offensive records aplenty this season, posting more points and tries than any other team, and they scored another three five-pointers in claiming their 18-point victory; but the scoreboard and the bare statistics do not tell the full story. 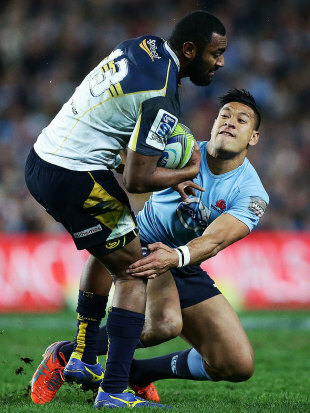 The Brumbies dominated possession and territory but could not breach their arch-rivals' defence in the second half after turning round just three points adrift, Nick Phipps illustrating the Waratahs' refusal to be beaten when he produced try-saving tackles on Tevita Kuridrani and Robbie Coleman on either sideline within three phases of the other. "You do what you've got to do, I guess" Phipps said. "We wanted that. We really wanted that; that was a massive game for us. It was one of those nights tonight where we just had to defend. We did a lot of work there, we really enjoyed it, and that's where you win games." 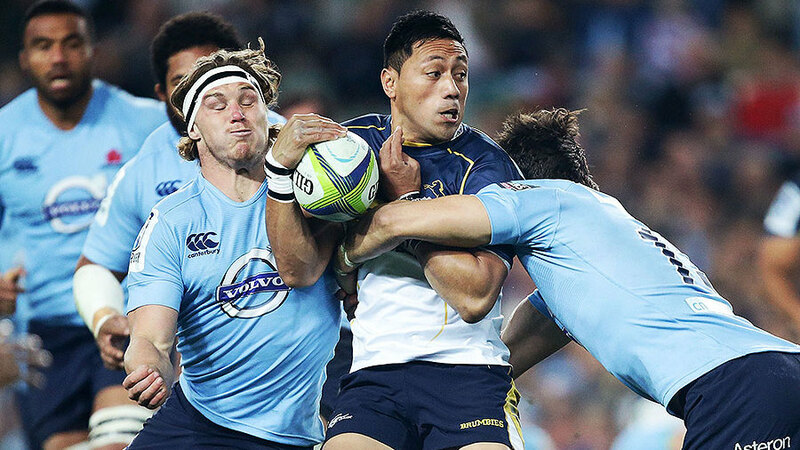 Brumbies captain Ben Mowen hailed the Waratahs, saying "they're obviously the best defensive side in the competition for a reason" while suggesting "they dealt with [the pressure of finals football] a lot better than us, little moments in the game cost us". "We had more than enough opportunities in their 22 to come home with a lot of points, more than enough, and you've got to give credit to the way the New South Wales guys held on," Mowen said. "They didn't panic; defended really well; and dismantled our maul, which is a strength of ours." The hosts opened the scoring just two minutes in, when Alofa Alofa picked up a loose cutout pass from Nic White to sprint 60 metres and touch down under pressure from Jesse Mogg. But any hopes the hosts and their home fans had of a runaway victory were dashed almost immediately as the Brumbies put them under continued and relentless pressure. Bernard Foley extended the lead with a penalty against that run of play before the Brumbies hit back; Henry Speight touched down in the right corner, put into space by Matt Toomua after more sustained pressure, and Christian Leali'ifano landed a penalty, but the Brumbies almost immediately conceded a penalty for Foley to kick the Tahs into a three-point half-time lead. The visitors never again would be so close on the scoreboard. The Waratahs looked dangerous with ball in hand on the rare occasions when they secured possession, and they scored again after a promising raid that had seemingly ended with a grubber kick from Adam Ashley-Cooper; Kurtley Beale wrapped Mogg in a tackle at the next phase and then ripped the ball away to scoot over in the left corner. 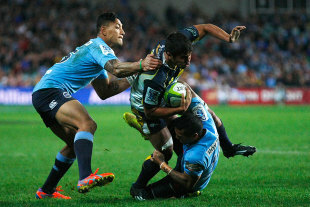 The Brumbies kept coming, stretching the Tahs' defence across the full width of the field, but the hosts' competition-leading defence would not be breached and they iced the victory with a long-range break after Benn Robinson had stolen the ball following a break by Brumbies substitute winger Joe Tomane. The ball went to Will Skelton, who beat the tackles of three Brumbies before offloading in superb fashion for Foley to cross untouched. "That was pretty hard-core footy," Waratahs coach Michael Cheika said. "The Brumbies are a physical team, and we had to go out there and match them - and keep that going for longer than they would. They were getting into our ruck - we know they're good at that - but we just had to keep delivering that platform so that in the last 20 minutes a few cracks would appear and we could maybe take advantage." The Waratahs now play the Crusaders for the third time in as many Super Rugby grand finals as they chase their maiden title after defeat in the 2005 and 2008 deciders in Christchurch. And they will not be buoyed by their record against the seven-time champions, as they have lost 11 consecutive encounters since last defeating the New Zealand team in 2004. But Waratahs captain Michael Hooper is undaunted as his team is on a franchise-record eight-game winning streak. "You want to beat the best," Hooper said. "We haven't played the Crusaders this season and if we knock them off we'll deserve to lift the trophy."